Cinnamon rolls, buns, swirls — we can call them whatever! — but almost nothing can beat these made from scratch sweets with a cup of black coffee in the morning. At first we need to prepare leaven. In a microwave-safe bowl heat milk until it becomes slightly warm. Add sugar (1), dry yeast and flour (1) to milk and mix everything well. Leave the bowl in a warm place for 30 minutes (this time needs to activate the yeast and make it work). The mixture will significantly increase in size. In a bowl of stand mixer with paddle attachment mix eggs, sugar (2) and butter until well incorporated. Add prepared earlier leaven, salt and vanilla extract, mix everything together. Add one third of flour (2) and mix it in on a low speed. Gradually add the remaining flour and change the attachment to hook. Knead dough on a low speed for good 5 minutes. The dough should become uniform and non-sticky. Transfer the dough to a surface slightly dusted with flour and knead it with your hands for a bit. Place in a dry clean bowl, cover with a towel and place in a warm place for 1-2 hours. The dough should increase in size twofold. When time is up, press the dough down and knead for one more minute. In a bowl combine sugar and ground cinnamon. Divide dough into 5 pieces. Working with one piece at a time, roll out the dough into rectangle. Using a culinary brush grease the dough with butter and then sprinkle over the cinnamon-sugar mixture. 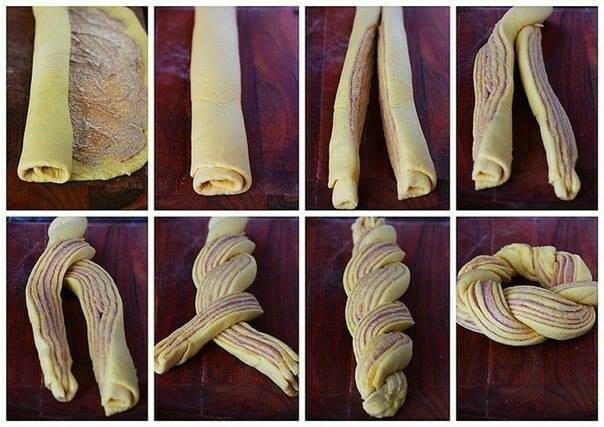 Starting with a long side, roll the dough up. Cut the roll in the middle. And then the fun part begins! How they say — “A picture’s worth a thousand words”? Well, here comes the picture 🙂 Shape the rolls as shown and place buns on a baking sheet lined with parchment paper . Repeat the process with remaining dough. Leave the buns to prove until they increase in size, 15-25 minutes. Preheat the oven to 200 C/390 F. When swirls are ready, slightly grease them with remaining butter and place the sheet in the oven. Bake for 20-25 minutes until nice golden-brown color. What’s your brightest food-related childhood memory? It all sounds so familiar to me. Smells like a cinnamon in the air after reading your post. Childhood memories are so strong! And cinnamon brings sense of warmness to a place, right? These are gorgeous! I love cinnamon rolls, but these look even better! They’d be perfect as part of a little brunch spread. Thanks for sharing! Oh yeah, and if this brunch is somewhere outside, on a blanket, near the ocean… We should plan it sometime soon! hi these look lovely! Two questions, I guess I would see clearly once I make them, however, does this recipe make 5 of the buns? Hi Ann Marie (what a lovely name you have!) and thanks for stopping by! Do you know if any of this can be made the night before? Cinnamon rolls take so long to make day-of! You brought an interesting question, I might need to mention such things in the recipes. Thank you!